Patrons frequent the Westport Farmers Market on May 25 despite heavy rain. 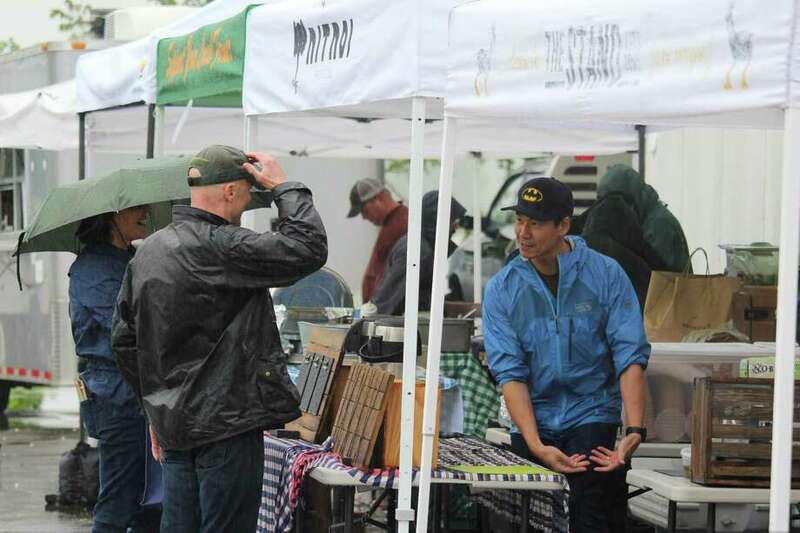 WESTPORT — A popular town tradition since its inception in June 2006, the Westport Farmers Market is in full swing, drawing crowds even in the pouring rain. Every Thursday from 10 a.m. until 2 p.m., the Imperial Avenue market offers fresh, local produce from area farmers and restaurants, including a chef demonstration each week. Jessica Bengtson, executive chef of Terrain Garden Cafe, will be at the market each week and is set to put on a demonstration later this season after a deluge on May 25 put a halt to the demo. Terrain is a sponsor of the farmers market and Bengtson plans to incorporate produce purchased from the market each Thursday into dinner specials at the restaurant. One such dish Terrain offers is called the farmers board, which features pickled and raw vegetables. “It’s a gorgeous combination of beautiful vegetables,” Bengtson said. The first installation of the farmers’ market was 11 years ago when the late Paul Newman and chef Michel Nischan organized a market in the parking lot of the Westport Country Playhouse. Cochran-Dougall took over in 2010.